It's mid-week and if your new school year is anything like mine you feel like you can't quite catch your breath! It's easy to get bogged down with all of the extra "stuff" that seems to pile on with every new year. So today lets focus on the positive. 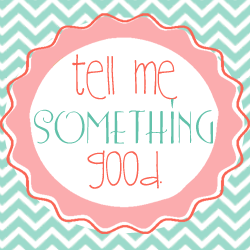 It's time to Tell Me Something Good. Link up with at least one good thing that's happening in your classroom and one good thing that's happening at home! My students are really using their phonics dance to sound out words and I'm so impressed with how that is changing their writing. And today on our daily 5 rotation to read to self we made it to 11 minutes! That's wild! My husband and I have made our travel plans for Thanksgiving and we're heading up to Seattle! Holla! Plus my niece just celebrated her 2nd birthday and she could not be any cuter! Now it's your turn to link up your Something Good! Yay for Thanksgiving trips! And YAY!!! for 11 minutes!!!! That's so great for firsties! What day are you on? We're at 10 minutes for Read to Self and going for 9 tomorrow with Read to Someone. I'm jazzed with their progress. As tedious as it became reading those anchor charts daily really helped! For real, Brenda, I get so sick of the anchor charts! I've got to give kinder credit for practicing so much with them! Hey Caitlin! I'm heading over to your blog right now! What a great topic for a linky party! I have to admit I can't stop singing the song.... I hope you enjoy the rest of your week! Ah Seattle! That's about 3 hours from me lol. Thanks for hosting this linky! It was very timely! What a fun linky. I've always wanted to go to Seattle. What a fun trip. Thanks for this linky! I LOVE intentionally focusing on the positives in life. This is great and positive! I'm your new follower. I just found your linky party from another blog. I love the idea! All of the negative stuff can really eat at you, it's great to really focus on all of the good stuff. After linking up, I became a new follower as well! I would love for you to stop by my blog and say Hi sometime. What a fantastic idea for a linky!! I'll be linking up next week. It is important to remember the positive! Thank you! Isn't is so great to have something to look forward to? Especially a vacation! Enjoy! What a great linky idea! And Seattle...another great idea. Just three hours from my neck of the woods. Enjoy! Hey! I found your blog linked up to another blog I follow and decided to join in for the linky party! I love the idea of sharing the good. I am your newest follower. Looks like you are approaching 1,000! (Early CONGRATS!) Would love for you to check out my blog! What a fun linky! Just what I need to get my mind on the good! How do we link up to this linky? I don't see the "link up" button. Hi there! I just tried to link up, but it's closed. Oh, well! I haven't been posting a lot lately. Feel free to check out my post! I'm a teacher and mama with a passion for creating a classroom environment that is fun and exciting!